These dog leashes are designed for pet owners living with a disability, making walking the dog easier and more enjoyable. Our dog leashes are made from braided polypropylene rope, which is softer than a nylon dog leash, making them safer for the dog and a user's hands. Designed for easy on and off usage and feature a simple-to-adjust snugger to secure the leash to the dog. There are no snap hooks to struggle with. 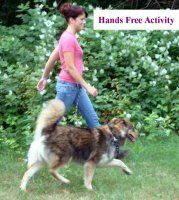 Wrap the dog leash around your waist or put it over one shoulder. The dog leash handle can be attached around a wheelchair or park bench as well. 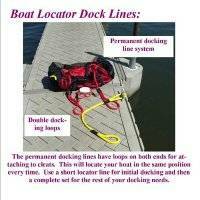 Our Soft Lines' Boat Dock, Fender, and Anchor Lines are flexible and easy to grip. Lightweight and simple-to-clean, they are resistant to most acids, alkalis, gas and oils. In cold conditions, they'll stay pliable and will not sliver. Soft Lines' polypropylene ropes release knots easier than nylon or cotton ropes. 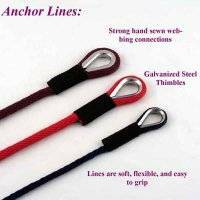 They feature strong hand-sewn webbing connections. The specific gravity of the rope is less than water so it naturally floats. Boaters won't lose a line overboard or get it caught in their propeller. Available in 3/8”, ½”, and 5/8” diameters: Soft Lines' Boat Dock Lines are constructed from multi-filament polypropylene rope, which makes them softer and more flexible than nylon boat dock lines. They can be customized and personalized with boat and company names. Available in 1/4”, 3/8”, ½”, and 5/8” diameters: Boat Fender Soft Lines are constructed from multi-filament polypropylene rope, which makes them softer and more flexible than nylon boat dock lines. 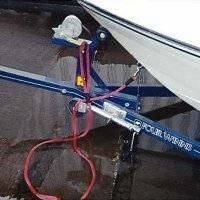 Available in 3/8”, 1/2”, and 5/8” diameters: Boat Launch Soft Lines are available in lengths of 15', 20', 25', 30' or custom lengths upon request to fit any boating need. Personalization is free and available with every order. 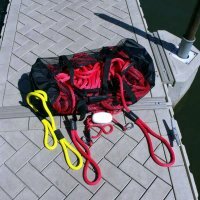 Mesh Duffle Storage Bag can be used to organize your dock lines and also personal items for boating keeping everything in one place. Available in 3/8”, ½” and 5/8” Reel Safety Lines are offered in 2', 3', 5', 10' and 15' lengths. 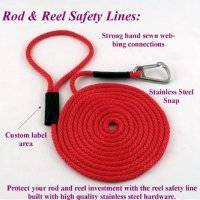 Fishermen can customize and personalize their reel safety line for free with Soft Lines' online options. 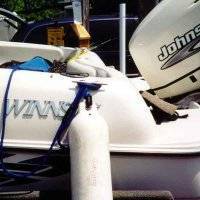 Used by scuba divers who require high performance equipment, all of our dock lines repel water giving you the convenience of allowing them to air dry and keep them well organized. 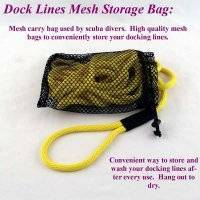 Mesh Dock Line Storage Bags are available in different sizes to help keep your dock lines organized, clean and dry for everyday use. Dog Leashes for beaches are constructed from soft, multifilament, polypropylene rope: these floating dog leashes rest on the water and don't put excessive drag on the dog when swimming, and won't pull a dog under like nylon or cotton rope leads that sink. 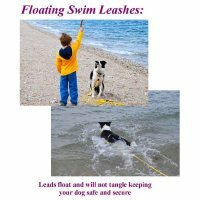 Because the leash floats, it won't become tangled up in the dog's legs while swimming and remains highly visible. We have selected stainless steel clip hardware that will not rust and the spring snap hook design will not clog up with sand. 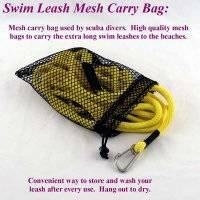 High quality nylon mesh storage bags to carry the extra long swim leashes to the beach. Rinse off your leash and open air dry it in the mesh bag. 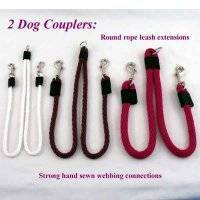 Dog leashes for two dogs are available in many different sizes. Walking two dogs is a breeze due to the no-tangle dog leash splitter design. 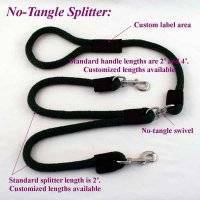 No matter what your dog’s do the no-tangle splitter feature keeps your dogs from getting the dog leashes tangled. Also available is a dog snap leash extender to be used on two dogs with traditional dog snap leashes. 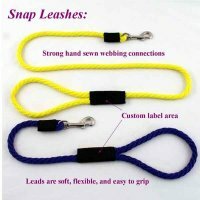 This is a traditional leash extender with two leads and snaps to be used with your original snap leash and accommodates two dogs. A one piece leash design with two leads and snap hooks connected to the handle portion with a high grade nickel plated swivel to eliminate a tangled leash. 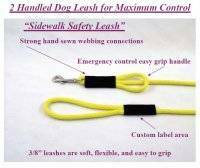 This double dog leash is great for high traffic areas. 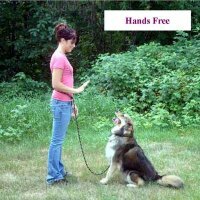 It allows your dog the comfort of a long roaming leash and you the safety of a short control lead. These extra long leashes for beaches have a sewn-in handle by the spring snap hook to allow you the option of holding your pet close to you in high traffic areas. 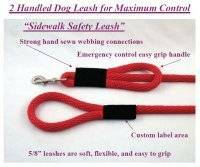 5/8” diameter leashes with heavy duty hardware for very large dogs. 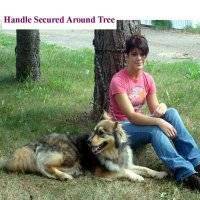 The extra handle allows you to control the dog close to your side. These large dog leashes are built for strong dogs. 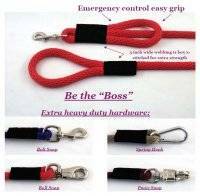 These dog leashes feature custom heavy duty hardware options and are re-enforced for heavy activity. They are offered in 5/8” diameter and many different lengths to meet your needs. 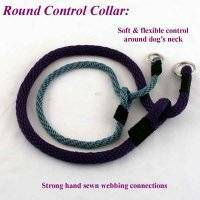 Dog control collars are available in flat weave and round rope designs. The dog control collars can be matched to customized dog snap leashes. Dog control collars move freely as your dog exerts pressure. 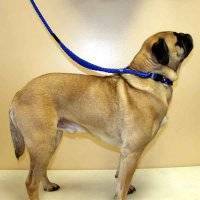 The dog control collars will not bind on your dog’s neck. The patented Harness Walker features a simple over the head self-adjusting collar for quick restraining of the dog. 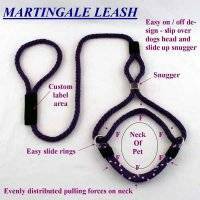 The second step is to loop the loose end of the dog harness under the chest of the dog and snap it onto the free sliding ring. This dog harness design floats when the dog pulls on the leash and distributes the load evenly over the dog’s chest and neck area. Dog harness built to accommodate small, medium, and large dog sizes. An adjustable sliding device adjusts the snugness of the harness after attaching the chest loop. 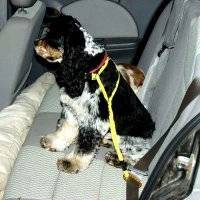 This is a combination harness and leash designed for convenience, security, and pet safety in and out of the automobile and promotes driving safety. Custom build your own personalized dog leashes and collars. Customize your dog rope slip leashes and snap leashes with your dog’s name. 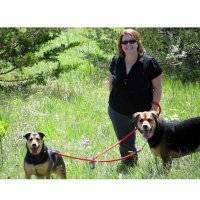 Including dog training leashes and specialized dog leashes for two dogs and large dogs. Feature a nickel plated metal snap hooks that resist rust. 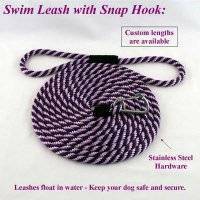 Four different diameter leashes are available to match all dog sizes and breeds. A leash and collar combination, designed to distribute the pets pulling force evenly around the dogs neck and relieve the concentrated pulling forces on the trachea. 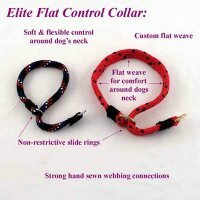 Dog control collars are available in flat weave and round rope designs. Dog control collars move freely as your dog exerts pressure. The dog control collars will not bind on your dog’s neck. 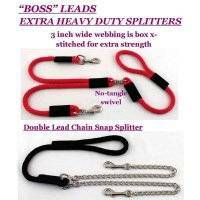 This double handle dog leash is great for high traffic areas. 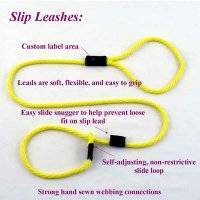 It allows your dog the comfort of a long roaming leash and you the safety of a short control lead. Enjoy all types of activities with the “Ultra-Lead”; walking, hiking, jogging, shopping, or just relaxing with your best friend. 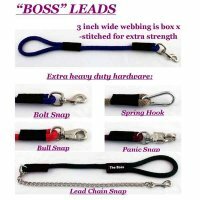 This is a multi-position, multi-use dog leash with an adjustable handle loop for many different options. 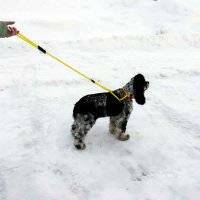 Short traffic leads in 1’ and 2’ options with additional options from 4’ to 50’ in length for extra long leashes. For dog training, jogging, and outdoor activities. The hands-free design leashes enable users to wrap the dog leash around their waist or put it over one shoulder. Different training programs require specialized leashes to accomplish each specific training need. Short leashes, long leashes, multi-purpose leashes and collars all meet a specific requirement for training. Customized training leashes can be built for your needs. 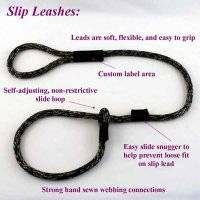 Slip leashes are designed for easy on and off usage and feature a simple-to-adjust snugger to help prevent a loose fit and secure the leash to the dog. 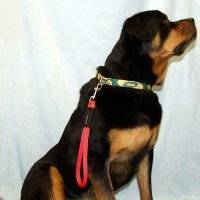 This leash is a leash and collar combo, designed to distribute the pets pulling forces evenly around the dogs neck and relieve the concentrated pulling forces on the trachea. 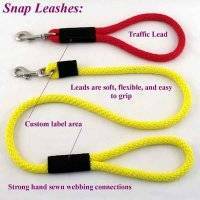 •	Snap leashes feature a nickel plated metal snap hooks that resist rust. 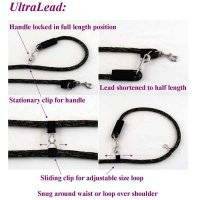 Four different diameters leashes are available to match all dog sizes and breeds. Customize your hunting dog leash with color and length specific to your hunting needs. 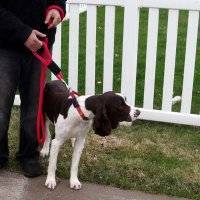 Specialty leashes include a hands free design allowing you to safely handle your firearms and control your hunting dog. Short and double handled leashes keeps the dog close to your side. This dog leash is a hands-free leash design that enables you to wrap the dog leash around your waist or put it over one shoulder freeing up both hands. A high quality nylon mesh carry bag that is used by scuba divers who require high performance equipment. All of our leashes are washable and this gives you the convenience of rinsing out your leashes and allowing them to air dry. 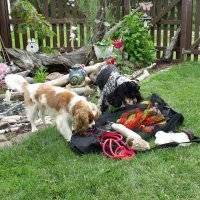 This large mesh duffel storage bag can be used to organize your dog’s personal items for hunting and travel keeping everything in one place. Different size nylon mesh storage bags help keep your dog leashes organized, clean and dry for everyday use. 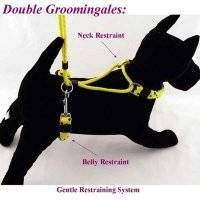 The patented “Groomingale” eliminates the harsh pinching forces that are exerted with existing rope noose restraints. This design floats when the dog pulls on the harness and distributes the load evenly over the dog's body. The "Groomingale" dog grooming harness is made from a custom woven soft multi-filament polypropylene material that is extremely soft, durable and washable. 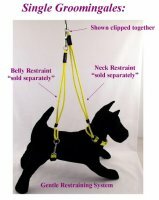 The unique floating design gently and evenly distributes the pulling forces in a full 360 degree pattern and protects the dog’s neck. Features an easy open snap clip to loop around the dog’s belly or chest area along with the floating design. A patented one piece design neck and belly restraint system offering a two point anchor system for superb pet support and safety. 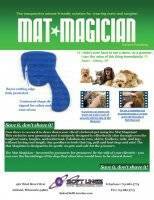 The Mat Magician dog de-matting tool is uniquely designed to effortlessly slice through even the toughest mats, tangles, and undercoat on your dog or pet. Fabulous on ears, skirts, feathers, tails, and legs without losing coat length.